There’s a new kid on the block or, well, Capitol Hill. 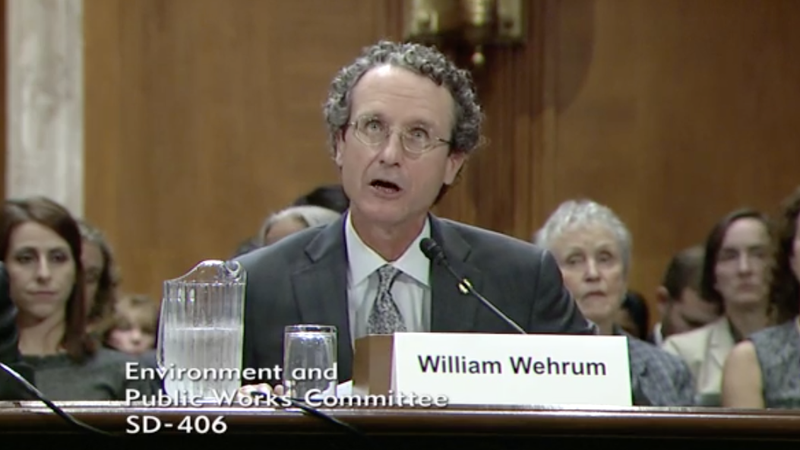 The Senate confirmed William Wehrum to head the Environmental Protection Agency’s Office of Air and Radiation last week, on November 9. By most standards, this is the EPA’s second most important role. And, like the administrator role, it will be filled with someone who has a reputation for riding with industry giants. Wehrum barely made it, though; the vote was 49-47 with Republican Sen. Susan Collins being her sole party member to reject Wehrum’s confirmation. But why? How could anyone resist this face? Sure, Wehrum has a history of defending major energy companies, like the American Petroleum Institute and Utility Air Regulatory Group, in lawsuits against the EPA. But during his time serving under former President George W. Bush, as both general counsel to the Office of Air and Radiation and then acting assistant administrator, he built a relationship with the Clean Air Act. Mostly, the relationship involved trying to weaken it. So, yeah. He’s got years of experience. The question is: Should a dude with that kind of experience be the one calling the shots for the EPA’s Office of Air and Radiation? First, you might want to know what the office does. For one, it’s responsible for implementing the Clean Air Act. Wehrum has always seemed more interested in cheapening the act than strengthening it, Environmental groups like the Natural Resources Defence Council would sue the agency pretty frequently during the Bush era—mostly for its Clean Air Act changes. And Wehrum had a lot to do with those changes, both as general counsel and as acting assistant administrator. Now, he’s going to have the power to do that all over again with a president that wants to go further than Bush in deregulating environmental policy. Wehrum will be the guy spearheading the EPA’s attempt to repeal the Clean Power Plan, former President Barack Obama’s landmark climate policy to reduce greenhouse gas emissions from power plants to meet the Paris Agreement climate targets. President Donald Trump doesn’t even acknowledge climate change is real, much less that it’s the result of man-made pollution. Wehrum, at least, has acknowledged climate change is real and that humans contribute, but he was clear during his confirmation hearings in October he wasn’t sure whether humans were the main cause. Vulnerable communities—be they communities of color or low-income communities—are where the biggest environmental threats lie, as climate change creates a “deadly double” scenario, as Ali put it. These communities are battling pollution while also having to bear the brunt of severe climate change impacts through extreme weather. Examples of what the future will look like can be seen in Texas after Hurricane Harvey and Puerto Rico after Hurricane Maria. With Trump attempting to repeal the Clean Power Plan, Ali worries things will get worse. “By that dismantling, our most vulnerable communities are going to bear the brunt of the decisions he’s made,” he said. Again, Wehrum is down to dismantle. In 2002, while serving as general counsel, he helped push through a rule to lower emission standards for formaldehyde, a probable carcinogen that can be found in some wood products. In 2004, Wehrum weakened the Clean Air Act’s mercury emissions standards, using language similar to industry memos. Mercury is bad news, man: Inhaling it in high amounts can lead to kidney and respiratory failure, as well as death. The case remains on hold while the Trump administration decides whether to repeal the underlying regulation entirely. In short, mercury standards remain up in the air. And now, Wehrum will once again be in charge of air regulation. Sigh.